As a dog owner, you can expect to have to administer eye drops at least once during your pet’s life. They may be prescribed for anything from a routine treatment against an eye infection to an important medication for a long term eye condition. In this guide we explain the best way to administer eye drops to your pets and the reasons why they might be needed. When you’re administering eye drops, you want to make the whole process as simple and stress free as possible for you and your dog. Ensure that you’ve removed the lid from the eye drops along with any protective caps that may be left on the pipette. Once you know that the fluid will flow you’re ready to go. When your dog is settled, sit them down in front of you. Securely and firmly put one hand around your dog’s muzzle and tilt their head upright. Holding the bottle of drops you should approach your dog’s eye from behind the head. 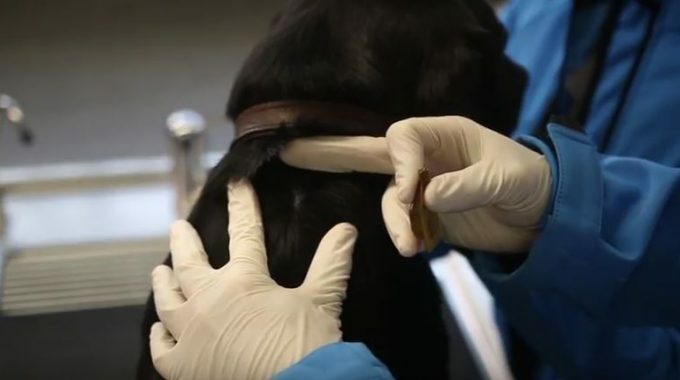 By doing it like this your dog will not get stressed at the sight of the eye drops. If your dog can get stressed easily and is unlikely to sit still for long enough, an assistant may be useful to ensure your dog’s head remains still so that you can administer the drops. The assistant should focus on steadying the back of the head and the body, whilst you focus on accurately administering the eye drops. What conditions may you need eye drops for? Eye drops can be a vital part to managing long or short term ailments for your dog. Luckily, Knutsford Vets have their very own ophthalmist, Paul Adams. Here he explains the various eye conditions that might need to be treated by eye drops. Dogs can present with many different eye problems throughout their lifetime. Some may be routine issues that will go away with simple treatments, whilst others may be the sign of more serious problems that require an operation. Most eye ailments will usually require at least some form of eye drop medication though. Conjunctivitis – This is an inflammation or infection of the conjunctiva and it affects around 5% of dogs that are presented at UK veterinary practices. The symptoms include pinkness of the eye, excessive blinking and often a discharge. Cataracts – These are the development of opacity in your dog’s lens and can affect their vision. Without treatment these will eventually cause blindness. Cataracts account for 2% of all cases at UK vets and vets should be consulted if you notice and cloudiness or greying in their eyes. Kerato-conjunctivitis sicca – This condition is a dryness of the eye caused by a lack of fluid coating the eyeball. It can be characterised by excessive blinking and swelling in the eye. Entropion – This is an abnormality of the eyelids which causes it to roll inwards. It can cause irritation of the eye, resulting in pain and damage to the cornea. Eye drops can be used to alleviate symptoms, however surgery is often required for the effective treatment of entropions. Uveitis – This is an inflammation of the inner portions of the eye. Around 0.2% of all veterinary cases are to treat uveitis. The condition is usually the symptom of a more serious illness and is characterised by excessive blinking, squinting, discharge and sensitivity to light. These are among the more common causes for dogs that visit the surgery, with less common causes such as glaucoma (a buildup of pressure in the eye) and hyphema (blood in the eye) secondary to trauma or high blood pressure also seen from time-to-time. What are the different drops I may be give to use? If your dog has the symptoms of any of the conditions that we have mentioned in this article, then you may want to book an appointment with us today. Register your pet today and contact us on 01565337999. 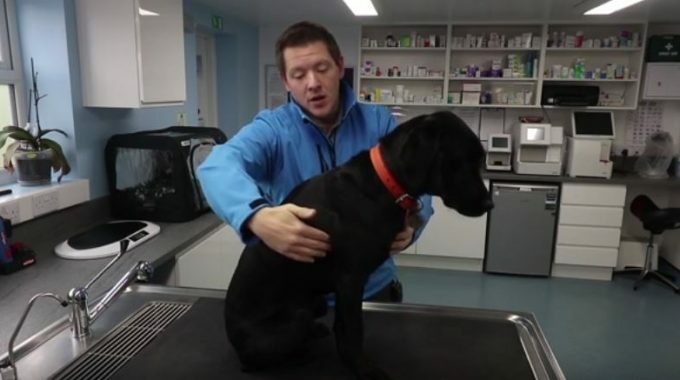 We have a range of vets advice articles across our site that will help you deal with your pet’s ailments.